Having grown up among the concrete confines of the City of Chicago, the possibility of having an eagle’s nest in a backyard tree is not an ordinary experience for me, as it might be for life-long Lake Forest Park residents. When a recent territorial fight broke out in a tree in my backyard it was startling. I heard a very loud crash, and screeches that bellowed the sound of trouble. It sounded like something was seriously wrong in that tree. My neighbors heard it too and we all went outside, managing to find each other in the almost pitch black nightfall. They too had heard the commotion and saw an eagle fall out of the tree and land in my backyard! They assumed it was dead, but it wasn’t. As humans approached, the eagle was startled and ran into another neighbor’s yard. After a neighborly search team could not find the frightened bird, the group departed. Responses, suggestions and offers to help came quickly and it was great to hear back, as this was both an exhilarating and disconcerting experience. We all felt helpless and concerned for this eagle and the eaglets, and because it was evening, there was no one to call for advice. But about an hour later, we heard the eagle’s familiar sounds and felt it had probably returned to the nest. The eagle was most likely stunned from the territorial attack, as was suggested by a Lake Forest Park Stewardship member. 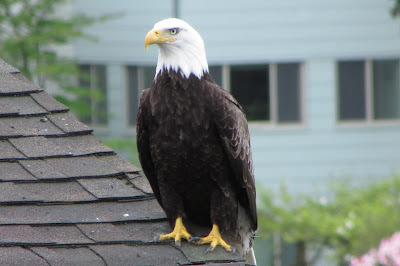 The next morning, we saw two eagles flying again into the tree, so we felt all was ok.
Everything appeared to be normal again, but three days later on Easter Sunday, while washing dishes at the kitchen sink, I looked out the window and saw an adult bald eagle walking on the lawn. The eagle was attempting to fly, and got its wings and talons off the ground for just a bit, but then dropped back down to the ground and walked off into another neighbor’s yard. By now we knew where to call for help - PAWS Lynnwood - and two representatives came within an hour and searched for the raptor but unfortunately did not locate it. This could certainly have been the eagle that was involved in the original territorial attack described above. The PAWS representatives also took a look into our giant Douglas Fir trees but the branches were too thick to see a nest. PAWS representatives also thought that because the eagle was able to fly off the ground some, it could be healing and looking for a ravine to continue that process. There is a ravine near where it was seen headed. Reflective now that we live in a special place where bald eagles have the kind of large trees near open water to mate and to nest, and that at times, nature will just have to decide what a raptor’s fate is. We feel thankful to the many generations of residents who kept our over 100-year old City so eagle and nature friendly. And with our relatively lower levels of human activity in this haven, we have all the ingredients that attract eagles and other wildlife to follow the north end wildlife corridor. Dedicated community volunteers help protect this richness, so thank you all who care so deeply and work so hard to protect our urban wildlife! Following are some things we learned as wildlife novices. Next time we can avoid sending urgent emails to overworking LFPSF volunteers! It is a difficult thing to approach injured raptors, it can stress them more. This site explains that well. If you encounter injured wildlife, contact PAWS at 425-412-4040. For other areas, see this site. A territorial attack is a normal thing for eagles. They can handle really hard landings. It can take them an hour or two to recover. However, do not assume they are ok and do report the incident to PAWS. Eagles like to return to the same nest and nesting territory year after year. Studies have shown that when juveniles are ready to mate, they also like to return to the area where they were born. Only about 1 in 10 baby eaglets make it to adult age. Once an eaglet reaches adult age (4-5 years old) they fully develop the distinctive white head, and as adults they now have a 90% survival rate. An average nest size is 4-5 feet in diameter and 2-4 feet deep and can often weigh 1,000 lbs. or more. The eagle adds more nest material each year, and the largest recorded nest weighed over 6,000 lbs! In our area, eaglets are hatched in the spring (March-May) time frame and leave the nest in mid to late summer. An eaglet can take their first flight at 10-14 weeks – they are almost full grown by then. The density of nesting eagles depends on factors that affect habitat quality including prey, the degree of human disturbance, and the availability of nest and perch trees. Let’s all do our part to keep the ‘forest’ in Lake Forest Park, and please also consider showing support to the over 20-year old non-profit in our community - the Lake Forest Park Stewardship Foundation. And of course PAWS in Lynnwood, too! This year’s theme for the LFPSF spring fundraising event to be held on Saturday, April 7th is “May the Forest Be With You.” Yes, we certainly have to agree, may this forest always be with all of us and future generations. Visit their webpage to purchase tickets, to make a donation, or to find out about volunteer needs. They even have a place to report wildlife sightings and they are mapping where nests are built throughout our nature loving City!